U.S. Bank announced today that the company has hired veteran digital leader and innovator, Derek White, as chief digital officer responsible for leading the company's newly combined digital team. White will report to U.S. Bank chairman, president and CEO Andy Cecere and be a member of the company's Managing Committee. White will be responsible for the company's enterprise-wide digital strategy, including innovation, digital products, development, omnichannel and Agile (News - Alert) initiatives. His integrated team will drive the company's digital strategy and functionality, integrating innovation enterprise-wide and bringing leading digital capabilities into all of U.S. Bank's lines of business as well as current and future partnerships. The team's efforts are focused on ensuring the company's customers can work with U.S. Bank when, where and how they want. "U.S. Bank is investing in the technology andtalent to develop even more industry-leading digital offerings so that our customers can bank with us where, when and how they want," said Cecere. "Derek is an outstanding leader with a proven global track record as a digital innovator in the banking industry. He and his team will be instrumental in deepening our commitment to provide our retail and institutional customers with the capabilities that make it easier and better to bank with U.S. Bank." The company has made significant, ongoing investments in digital to respond to the needs of consumers and the evolving marketplace. Recent examples of the company's digital progress include the digitization of several lending processes, the launch of Simple Loan, and the recent launch of an entirely new mobile banking app. "It's an honor to have the opportunity to join U.S. Bank, a company I have admired and watched closely throughout my career," said White. "U.S. Bank has a solid reputation as an innovator in banking, is respected for its strong culture and admired for its people. I am looking forward to leading this dynamic, talented team as we help create the company's future. It's going to be an exciting time for everyone who banks with, partners with or works for U.S. Bank and it's a privilege to be part of it." White was most recently global head of client solutions with BBVA in Spain. In that role he led a team of nearly 10,000 people focused on concepting, designing, creating and launching digital and innovation work - from products and services to data science units and venture creation - that spanned across BBVA, all in service to the company's customers, clients and employees. 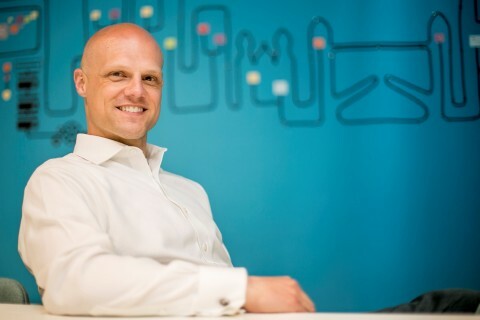 Prior to that, he spent 12 years with Barclays in several leadership roles including chief design & digital officer. He and his family will be relocating to the United States when he begins with the company this spring. U.S. Bancorp (NYSE: USB), with 74,000 employees and $467 billion in assets as of December 31, 2018, is the parent company of U.S. Bank, the fifth-largest commercial bank in the United States. The Minneapolis-based bank blends its relationship teams, branches and ATM network with mobile and online tools that allow customers to bank how, when and where they prefer. U.S. Bank is committed to serving its millions of retail, business, wealth management, payment, commercial and corporate, and investment services customers across the country and around the world as a trusted financial partner, a commitment recognized by the Ethisphere Institute naming the bank a 2019 World's Most Ethical Company. Visit U.S. Bank at www.usbank.com or follow on social media to stay up to date with company news.